Jesus is the subject. As Jim Lyon acknowledged on Tuesday at the Fairfax Regional Convention, some who have heard the line too readily dismiss it as simply a slogan or tagline. But it is so much more, as evidenced by the weight those four words carry and the way they’ve become part of the lexicon of the Movement—and tribes beyond. A common theme emerged during the Fairfax Regional Convention on Wednesday as the implications of “Jesus is the subject” became clear in the face of generational, geographic, cultural, political, socioeconomic, and ethnic division in the world and the church. Teachers Rod Stafford, Jo Anne Lyon, Kevin Earley, and Brad Lomenick called the church to recognize the greater life that awaits all of us when we bridge the gaps that would otherwise separate. Frank and open discussion at the Town Hall on racial unity, as well as opportunities for question-and-answer throughout the day, encouraged the Church of God to address root issues that stunt growth and suppress life. 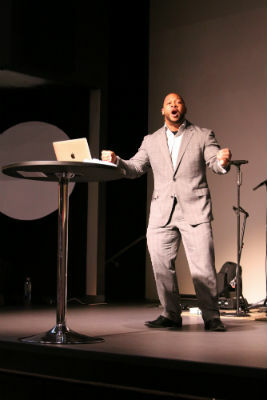 Among other exhortations, Rod Stafford, host church pastor, challenged listeners to “share the microphone” with young and emerging leaders. Bridging the generational gap that often cripples not only future, but also present ministry, is exemplified well at Fairfax Community Church. Rod insists that this sharing “of the microphone” does not mean giving up the platform, but bringing others on the platform with you. Leaders who do this, Rod insists, enhance, not diminish, their influence. Kevin Earley preaching on Wednesday. When Jesus is the subject—and not traditions, methods, or other surface-level matters—the walls that tend to divide instead tend to crumble. Jo Anne Lyon has said that the Church of God is perhaps best positioned among faith groups today to lead by example with racial reconciliation. She reminded us that God has “greater things” in store for the Church of God, but we must be willing to nurture relationships and hear one another’s stories and perspectives. “We must truly learn to listen to each other,” she exclaimed on Wednesday morning. Racial unity panel on Wednesday at Fairfax. 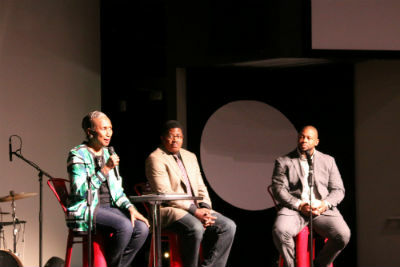 The Town Hall on racial reconciliation featured a panel of three of the members of the Church of God Commission on Racial Unity—Paul McAllister, Cheryl Sanders, and Kevin Earley. Space and time were given for an extended period of interactivity during which a variety of questions were fielded and insightful comments made about such a timely topic. While the world continues to point fingers, speculate, and hate, God’s church has been given a wonderful opportunity to be daringly different. With hearts tuned to the Holy Spirit, the afternoon conversation was no doubt a battle won for the kingdom. Though the war continues to rage, listeners from a diversity of backgrounds lovingly exchanged ideas and considerations for giving life into our home congregations and communities. Jesus was the subject. Moments of inspirational worship marked a marvelous evening, as did a practical message on leadership from regional guest speaker, Brad Lomenick. 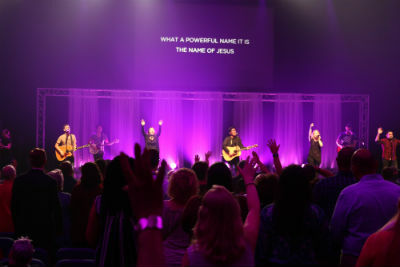 The atmosphere was electric in the main auditorium (affectionately called the “Big Blue Room”) as the gathered saints awaited a clear word from the Lord through the longtime Catalyst leader. Expounding on the “salt and light” passage from Matthew 5, Brad Lomenick urged leaders to be real, and to really embrace the life-giving, hope-giving role God has given them. Learning from the great variety of teachers, and learning from each other in plentiful dialogue, Day Two of the Fairfax Regional demonstrated that we need each other. We are, no doubt, better together. This entry was posted in All Church of God, Church of God Convention, Northeast and tagged Brad Lomenick, CHOG Regional Convention, convention, Fairfax, Fairfax Community Church, Fairfax Regional Convention, Jo Anne Lyon, Kevin Earley, Life Fairfax, LifeFairfax, Rod Stafford, VA, Virginia. Bookmark the permalink.